James Jurgensen, C'18, plays a key role in building the effectiveness of the OCE, helping develop curriculum for other Bonner Leaders and collecting data that can be used for assessment of the whole program. Four students are profiled in this article, including two Bonner Leaders: James Jurgensen '18 and Sam Kern '19. James Jurgensen, C’18, is playing a key role in building the effectiveness of the OCE. 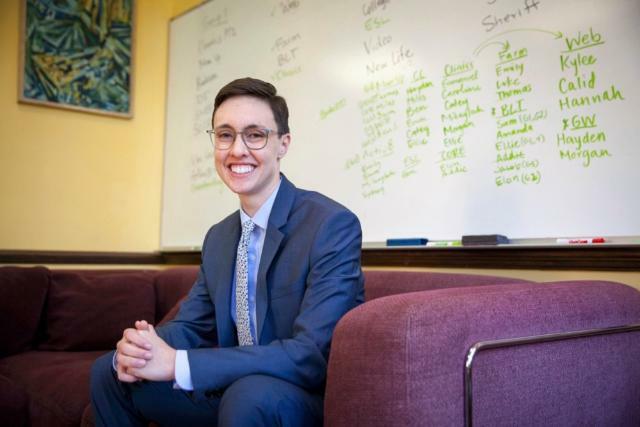 In Kelsey Arbuckle’s pantheon of the civically engaged, Jurgensen is an “office Bonner.” In his case, that means as a senior intern, he is helping develop curriculum for other Bonners and collecting data that can be used for assessment of the whole program. As a Bonner Leader, Sam Kern, C'19, works at Pelham Elementary School, encouraging healthy eating and exercise among schoolchildren. He also recently started a Rotaract chapter at Sewanee. Sam Kern’s journey to Sewanee began when he was selected as a Bonner Leader as a first-year student. His service leadership work takes place at Pelham Elementary School, where he works in the Activ8 program, which encourages healthy eating and exercise among schoolchildren. But after coming to Sewanee, Kern began to think more about the pre-business program, and he applied for and was accepted as a Carey Fellow, the business honors program that is implemented by the Babson Center for Global Commerce. The Office of Civic Engagement team includes (from left to right): Director of Civic Engagement Jim Peterman, Senior Associate Director Nicky Hamilton, C'99, Associate Director Dixon Myers, Assistant Director Robin Hille Michaels, Office Coordinator Kai Koopman, and Programming Coordinator Tyler Augst. While many colleges have been pursuing community partnerships for years, Sewanee’s claims for distinctiveness rest in part on the unparalleled partnership between the College and the local community fund. That partnership provides the engine that gives students extraordinary opportunities to learn in a program that represents an ideal expression of the liberal arts. And it is a structure on which many extraordinary people are now creating a program that will be a persistent feature on the Sewanee landscape for years to come. Read the full profile of Sewanee's civic engagement programming published in their alumni magazine here. Click here to read feature story by Kai Koopman in Sewanee Alumni Magazine profiling Emmie Chambers' years-long involvement with a local rural medical clinic fosters deep connections to people and place, and prepares her for a future career.